Not just one Royal Wedding kiss but two! Prince William and Kate Middleton came out onto the balcony of Buckingham Palace smiling and waving along with the rest of the Royal Family. Greeted by cheers from a sea of people in front of them, the cheers very quickly changed to a chant in unison, 'KISS' 'KISS' the crowds began to roar. The couple looked at each other and then moved in for a very brief kiss on the lips, which lasted just a couple of seconds. Kate seemed very comfortable and William had a typical English gentlemen's awkwardness about him (actually very charming). However, as the planes flew overhead and most peoples eyes were averted upwards, the Royal Couple moved in for a second kiss that lasted longer and seemed far more natural than the first. 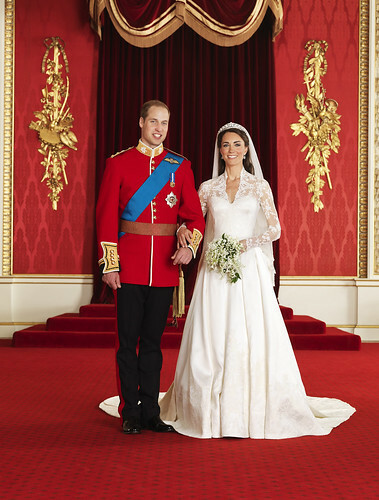 Prince William seemed much more comfortable the second time around. The first time a newlywed Royal Couple kissed on the balcony of Buckingham Palace was in fact William's mother and father, Princess Diana and Prince Charles in 1981. It is sad that Princess Diana was not physically here to witness the day but there can't be any doubt that she would be very proud of Prince William and the way he has conducted himself. Diana would also be hard pushed not to be happy with his choice of bride, aside from looking fabulous, Kate conducted herself with a confident elegance and grace befitting of any Royal bride, let alone a commoner. In Diana's absence Prince Charles and The Queen deserve credit for raising a fine young man who will no doubt make a very fine future King. Young girls around the world are in no doubt today that fairy tale dreams can come true and that said Prince Harry will not be short of female attention until he is safely wed himself. In fact his security may well need to be increased in the meantime. William and Kate are now enjoying their reception in Buckingham Palace whilst millions of people from around the UK and the world are celebrating in their own special way.